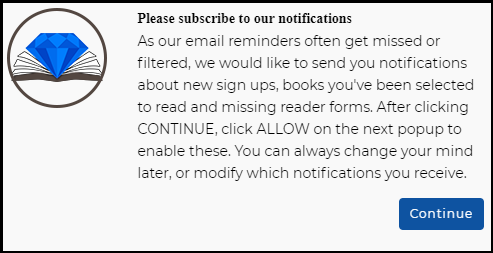 As our email reminders often get missed or filtered, we would like to send you notifications about new sign ups, books you've been selected to read and missing reader forms. After clicking CONTINUE, click ALLOW on the next popup to enable these. You can always change your mind later, or modify which notifications you receive. An ARC is an Advance Review Copy of a book. Generally, a lot of reviews on a book help it get noticed on Amazon and let other potential buyers know that others have already read and enjoyed it – thus helping sales as well. Sometimes these early reviews also help to generate excitement and buzz about their upcoming work, especially when the reviews start coming in positively, or if they start getting picked up or posted to different blogs or websites. The earlier a book has reviews, the sooner this positive effect can begin. To achieve this, an author may choose to send out free, advance copies of their newest book to fans or interested readers in the hope that those readers will then leave honest reviews of the book when it goes live. In some cases, they may even send out these copies after the book is already for sale, too. How does the Hidden Gems ARC program work? Hidden Gems (HG) has sent out over a thousand novels from hundreds of authors – usually more than one book per day, every day of the year. With so much variety, every reader will eventually see something that interests them, but at the same time, they will not be interested in (or have time to read) all the ARC offerings. For that reason, each of our books is opt-in, and because of our large pool of ARC readers, we often still must select only a subset of readers from those that are interested. Here’s how the process generally works. An author looking for reviews on their novel contacts us and provides us with the details of their book (cover, blurb, genres/categories, etc), how many reviewers they want us to send the book to, and when they want it to go out. A couple days before the book is due to go out, we send those author supplied details to all of our potential ARC readers of that genre*. If the book interests the reader, they simply click the sign-up link to be added to the potential pool. We ask that readers ONLY click the sign-up link for books that look interesting to them, and are books that they believe that they will enjoy and have the time to read and review over the next week. Don’t worry about missing out on an offer as there are always plenty more to come! *HG’s ARC program started out with strictly romance novels, but has since branched out to include all genres of books. Learn about choosing which genres you want to hear about here. On the scheduled date, Hidden Gems emails a link to the book to the readers that we have selected to receive it. This list is based on a number of factors and limited by the number of readers that the author has asked for – which means not everyone that signs up will always get the book. This email may (if the book is already for sale) also include a link to the review area on Amazon in case you finish early, as well as our reader form that you fill out for each book we send you. Learn how to improve your chances of being selected here. Selected readers are given at minimum a week (sometimes longer) to read the book before we send an email with the Amazon review link and reader form for them to fill out. Filling out the reader form for each book you were sent is an essential part of remaining in the HG ARC Program, regardless of whether you left a review for the book (or even read it). If you asked for the book and we sent it to you, please fill out the form. There is a field on this form for you to indicate that you couldn’t/didn’t leave a review on Amazon for this particular book, as well as a place to leave an optional comment to the author. Note that it’s fine to take longer than a week in cases where you don’t finish the book in time. Reminders to fill out the form will come automatically. Just fill the form out when you are ready. What are the expectations of an ARC reader? If you love to read books, love to share your opinion on Amazon about those books by leaving a review*, and are willing to fill out our extremely short and quick reader form for each book we send you, then it sounds like you’ll be a great fit for us. *Due to a recent change in Amazon’s policy, anyone leaving a review must have spent at least $50 on Amazon in the past. If not, they may not be allowed to leave reviews. Amazon’s decision in this matter is completely outside our control, so any issues you have with it should be taken up with Amazon directly. HG ARC Readers must be able to leave reviews on Amazon, as that is where our authors are looking for their reviews to be posted. **There are sometimes valid reasons why you cannot leave a review for a particular book, and that is understandable and acceptable, however please still let us know by posting a brief reason for not reviewing in our form so we know you are still participating. Note, however, that HG reserves the right to remove users from the program (or limit the number of books we send them) that we feel (in our sole judgement) are giving reasons for not reviewing so often that it seems to us that they either no longer have the time or the interest in continuing. In fairness to the authors, we want to send the books to readers that actually have an interest in reading them. How can I join/leave or change my ARC genre preferences? The easiest way to change which genres you’re interested in is by selecting or unselecting the desired genres at the bottom of your Dashboard and clicking Update My Preferences. If that’s all you want to do, you’re done. For Joining or Leaving the ARC program – On your profile page, enter “yes” in the “ARC Reader” field to be included in our ARC program, or simply remove the value in that box if you wish to leave it. To change genre preferences – Add checks next to each of the genres you wish to opt into, or remove any you wish to opt out of. For any changes made to this profile page, please remember to click Update Profile at the bottom or they will not be saved! Remember, if you’ve opted into the ARC program, you can expect emails from us about upcoming books looking for readers in those genres. If a book doesn’t interest you, just ignore the email and you won’t be bothered about that particular book again. However, if you do sign up for that book and are selected, you will receive important additional emails about that book so please make sure to read them. Note: To unsubscribe entirely from Hidden Gems, just click the “unsubscribe” link at the bottom of any email we’ve sent you. How many books will I get? Is there a minimum or maximum? There are no quotas on books you have to ask for or are allowed to ask for. You can sign up to read as many or as few as you want and think you’ll have time to read by their due dates (although getting reviews in past the due date is okay, too). The number of books you read has no bearing on your status as a reviewer and whether or not we will continue sending you books. You read when you have time. If you stop signing up for books for a week or a month or a year, and then all of a sudden you request one again, it will be like you never stopped. The only thing that affects your status as a reader with us is the consistency with which you fill out our reader forms and seem to be participating with the books that you HAVE asked for and were sent. Remember that our membership is made up specifically of people that love to read and love to leave opinions of what they read on Amazon – although we know that not everyone will choose to review every single book they’re sent. So just make sure that when you do sign up for a book, that you have the time and desire to read it by around the due date indicated in the sign up form. This date will always be at least a week, sometimes longer. And if you read the book sooner than that, even better! It’s also okay to take a little longer than the due date. It’s more of a date to aim for, but better late than never. Please note that while Hidden Gems does not have any limits on number of books you can read, Amazon may limit the number of reviews you can leave. I’m signed up to be an ARC reader. Now what? Details about new ARC books looking for readers will arrive each morning (EST) for the genres you have signed up for (if there are books in that genre scheduled for that day). Read the email, or check your Dashboard, to determine if you are interested in that book and have the time to do so by the indicated due date (at least 1 week – although it’s fine if it takes you longer, it’s more of a guideline). Only click on the SIGN UP link for the books that interest you and that you have time for. Note that each book is only looking for a limited number of readers, so not all readers will be chosen. We do our best to make sure everyone gets a chance to read often, provided those readers are in good standing with us (actively participating, regularly filling out their forms, etc), so don’t get discouraged if you aren’t chosen for each book you request. Just keep signing up. The more consistent you are with filling out the reader form, the more likely you’ll be chosen for a future book. A couple of days after the sign-up period begins, an email will go out to the selected readers for that book with a link to download the book. If you are unsure what to do with those files, click here. Unless there are unforeseen delays in the book getting delivered to us, those emails will come out around 9am EST, so please watch for them. You will also see books you were chosen for show up in your Dashboard where you can request for the book links to be re-sent to you. Note that you do not need to contact us again about a book once you’ve signed up – you’ll know if you were selected by the fact that you do or do not get the email with the book links. But if you are unsure, please check the “Your Current Reading List” section of your Dashboard. If you missed the email with the book links, please check your Dashboard. All the books you’ve been chosen for but haven’t yet filled out a reader form for will be found in the Your Current Reading List section, along with a link to have the book links re-emailed to you. That section will also include the due date of the book, the link to Amazon where your review can be left, and a link to the reader form of that book. Remember that even if you miss the due date, you can still download the books for some period beyond that and read it anyway. Better late than never. But get the books as soon as you can, as the links will not remain active forever. Once the reading period is up, readers who haven’t yet completed the reader form for that book will get a reminder email with the links to Amazon and their reader form. The reader form has a place for you to copy and paste the link to your review (click here if you’re unsure how to get your review link and paste it into our form) or a reason for why you couldn’t leave a review this time, as well as an optional comment for the author if you choose. IT IS IMPORTANT NOT TO MISS FILLING OUT OUR READER FORM – READERS THAT REPEATEDLY FAIL TO FILL OUT THIS FORM WILL BE CONSIDERED TO BE TOO BUSY TO CONTINUE WITH THE PROGRAM, AND MAY BE REMOVED FROM THE ARC PROGRAM WITHOUT WARNING. Feel free to participate in as many or as few ARC reviews as you have time and interest for. And remember that you can opt in or out of the ARC program, as well as change your genre preferences, at any time. Click here to find out how. Why don’t I get picked for all the books I want? There are a number of factors to consider here. The most important one is that each book only goes out to a limited number of readers, and we have thousands of readers signed up to our ARC program. While each book only appeals to a subset of those readers, in some genres there are still often more sign-ups for a book than copies we can send out. So while there is an element of chance that goes into things when all other factors are equal, here are some other factors that we may consider when making our reader choices. Fill out the reader form for EVERY book you are sent. Whether you reviewed the book or not, even if you never even read the book – you still need to fill out the reader form. If you missed leaving the review, just add your reason – it doesn’t have to go into any great detail. It’s mainly for us to get an idea of why you missed this one (there are plenty of valid reasons and we totally understand that), and so that we know you are still actively participating. Remember that you can access all of the reader forms you’ve missed whenever you sign up for a new book. Your Gem status will tell you how close you are to not getting books anymore, so be sure to keep up with the forms! As we said, missing the occasional review is understandable, but if you’re regularly leaving reasons why you couldn’t review instead of actual links to your Amazon reviews, then it could be that our books just aren’t for you. People that sign up for our program are ones that love to read and leave their opinions on Amazon of what they read and while those reviews are completely voluntary and it’s understandable that not all books will connect with all readers, if none of our books are good enough for you that you ever feel like reviewing them, then it’s likely we just don’t have the books you’re looking for. If that’s the case, it’s only fair to the authors that are providing us with the books, and the other readers, that we send them to people that do like this sort of content which means you may start to get less of them. However, if that’s not the case and there are some other reasons for your issues, just let us know. Also remember that our due dates are not hard deadlines or anything and some readers take longer to read a book than others so even if finish the book later and choose to review it, you can always fill out the form when you do. Better late than never! We try to limit the number of books we send to an individual reader to 1 per day maximum (with the occasional exception when one of the books is extremely short or more of a technical self help/cookbook type and the other is a novel) to give everyone a chance to read, but also because Amazon limits the number of unpurchased books that can be reviewed by a particular customer. As well, if there are more sign ups for a book than copies we can send out, one of the things we look at is how recently we’ve sent you books – favoring those that haven’t been sent any in a while over those that have been sent a book recently. How can you improve your chances at being picked for a book? If you see 2 or 3 books in a day that interest you, feel free to sign up to all of them. It’ll increase your chances of being chosen for at least one of them. We do make an effort not to choose readers for more than 1 book a day, but even if it happens feel free to read the books one at a time. If you miss the review due dates, that’s fine – better late than never. Just don’t sign up for others until you’re done (or almost done) with those ones and have filled out the reader form. Certain genres (like Romance and Erotica) have a plethora of readers while others have far fewer. You’re far more likely to be chosen for a genre with less overall sign ups, so if those genres interest you at all, make sure you sign up for them. You can view and edit your list of genres from your Dashboard at any time. What if I can’t leave a review for a particular book for some reason? We can’t and don’t force anyone to leave a review, doing so is voluntary. Besides, we understand that life gets in the way sometimes and that there are plenty of legitimate reasons why you couldn’t or didn’t want to leave a review. Maybe something came up and you didn’t have the time to read the book that you expected (although please feel free to read it at a later date and leave your review then – better late than never! ), or perhaps you just couldn’t get into the book and either didn’t finish it or didn’t like it and you don’t want to leave a negative review. That’s your choice and we know that not everyone will be able to leave reviews 100% of the time. Whatever the case, when circumstances do prevent you from reviewing a book that you requested and we selected you for, we still ask that you fill out our reader form. There is a field on that form for your reason for not reviewing. It doesn’t have to go into detail – it could be something as simple as “Started it but realized it wasn’t for me”. The important thing is that you fill out the form so that we know that you aren’t just done with the program and that you want to remain as an active participant. All that being said, our ARC program is designed for enthusiastic readers that enjoy leaving reviews on Amazon for the books they’ve read, so if you are regularly missing reviews then it could be that our ARC program isn’t for you. We aren’t going to remove you from the program for a few misses, but if it starts to get to the point where your reasons and empty forms are outweighing your reviews, then it’s usually an indication that our program isn’t a good fit for you. Perhaps the books we send out just aren’t to your taste? That’s okay… it happens. So if it seems like we just can’t find any good books for you, or that you’re too busy to participate, we may start sending less books your way until you have time to catch up or we start getting more titles that are interesting to you. It’s only fair to both the authors of these books, and the other readers that want to enjoy them. Whenever you sign up for a book to read, you’ll be made aware of your current status and see a list of reader forms that you still need to fill out. Once you miss too many, you may be prevented from signing up for any new books until you catch up. You can also see all of this information on your Dashboard. Removal from the ARC program is up to the sole discretion of Hidden Gems, however if your circumstances change and you find you have the time to participate fully again and wish to be reinstated, please contact us and we will try and work with you to make that happen. We’re always happy to help connect readers with great books! That’s the whole reason for our ARC service! When Should You NOT leave a review for a book? Aside from your own personal reasons, here are a couple of times where you should NOT leave a review for a book on Amazon. Either contact us or use the reason for not reviewing field. Don’t leave a review for a book you couldn’t read because of technical issue – contact us instead and we can help you out! What should I write in my review? That’s up to you, as all reviews are your own. However, since we know that as a reader you aren’t necessarily also a writer, we’ve written up some general tips for writing reviews on our blog. Help! I don’t understand how to log my review. IMPORTANT NOTE: If you still can’t figure out how to leave a review after reading this section, please contact us and we can help! Don’t give up or ignore your reader forms, or you’ll stop getting new books! If we’ve sent you an ARC book, then eventually we’re going to be sending you an email with instructions on leaving your review (unless you fill out the reader form before the review due date). There are 2 important steps here. Our email will include a link that takes you directly to the amazon page where you can log your review for the book. (This link can also be found on your Dashboard and on the reader form) Please do so as soon as you’re done reading (you can do it before the week is up if the book is available, in this case we likely sent this link within the email that contained the actual books that you downloaded) or when the review is due. It’s fine if it takes you a bit longer than a week to review, but please get it done ASAP. Better late than never. Note that leaving a review on Amazon requires an Amazon account that is able to leave reviews. Hidden Gems has no ties to Amazon, so the only way for us to know that you are leaving reviews is if you send us the link. You do so by copy and pasting the link from Amazon into our reader form. We sent the link to this reader form with each email asking for reviews to be logged, and it’s on your Dashboard as well. (In the event that you chose not to leave a review for this book, you still need to fill out this reader form but instead of the link, add the reason why you did not review). You may also leave an optional comment for the author about their book. This is a feature that Hidden Gems has developed to help readers fill out the reader form, and you can read more about it here. Pressing this button can usually find your review link automatically, but if it doesn’t work you’ll still have to send it to us manually. Read on for help on how to do that. Many people have trouble with this step, especially those on tablets or phones, so if that’s you then read on and we’ll try to help! Note that if you have access to a computer, the steps are far easier. After you submit your review on Amazon, they will either take you to a page with your review on it, or send you an email later if your review doesn’t go live immediately. That is the link we’re looking for. It’s also called a “permalink” to your review. If clicked on, this link opens up a page with just YOUR review to that specific book, and that’s the link we’re looking for. You can also get the link yourself (if you already left the page or deleted/can’t find the email) by going to the book you reviewed, finding your review, and clicking on the title of your review. Alternatively, you can click on your username (under the title) of ANY review you’ve ever left, and you’ll get to a page with all of your reviews. You can find the one you want by scrolling through that list and clicking on the review title when you see it. Okay, so once you’ve gotten to the review page that has JUST your review on it, you need to get it to us (Note that we are not looking for the review EDIT page, because only YOU can see that – here’s a tip, if your URL has the words “create-review” in it, that’s not the right link). How you do this depends on what device you’re using. It’s easiest to do this with a computer, so if you have one available we would suggest using it here. Click into the address bar with your mouse and COPY (right click COPY or Ctrl+C or Command+C) the entire URL. Go to our reader form and PASTE (right click PASTE, or Ctrl+P or Command+P) it into the review field. Add a comment if you want, and then click submit. You’re done! The steps are similar with a phone or tablet, however they may be specific to your device. Many tablets/phones will give you the COPY command if you tap into the address bar and continue to hold your finger down. (If the entire URL is not highlighted, you should be able to drag your finger to select the whole thing before selecting COPY, or click on “Select All” if given the option). Go to our reader form review field and tap it (and maybe hold it if the option doesn’t show up right away) and select PASTE. Fill out the comment field if desired and then tap Submit. You’re done! Help! I’m not getting all of the Hidden Gems emails! Email software programs and services have very strict filtering rules these days, and will often identify newsletters and emails coming from mailing lists as SPAM or JUNK, even in cases where the person receiving them has specifically signed up to receive them, as is the case with us. If you’re consistently missing our emails, then it’s possible that this is the issue for you. The best thing you can do to avoid this is add our email address (contact@hiddengemsbooks.com) to your contact list, safe sender list, anti-spam list, etc. How you do so depends largely on what sort of email software/provider you’re using, however there is a handy guide that gives instructions for all of the major email client programs. Please check it out and follow the instructions to add our email address to your email client by CLICKING THIS LINK. Remember that participation in our ARC program requires you to read the books that you sign up for regularly, as well as log your participation by filling out our reader form for each one – thus you don’t want to miss out on any of the emails with these links or instructions. So please make sure to fix this problem as soon as you can so that you continue receiving free books! Please note that visiting your Dashboard page daily makes most of our emails unnecessary, so it is highly recommended for anyone having issues with emails. What do I do with the book files? There are 3 possible book files that authors normally provide to our readers, each have their own benefits and uses, and readers can choose the one that works best for them. Note that to use any of these files, just click the corresponding link in the email we sent you and the file will download to your computer or device. PDF – A PDF file can be read by most devices and computers simply by clicking on it. This normally opens the book up and the user can begin reading immediately. Within a few minutes, the book should be available on your kindle! EPUB – Many non-kindle devices use the EPUB format, and many different programs and devices are designed to use it. However, as most of our authors are most concerned with Amazon (and Amazon does not use the EPUB format), not all of our authors choose to provide their books in this format. Most important – these book files are for your personal use only. Please do not share them with anyone. Instead, why not just encourage your friends to join Hidden Gems themselves? Why do you want my Amazon profile link? If you attempt to use our “Try to Find My Review Automatically” button, you may be prompted for your Amazon public profile link. It’s perfectly safe to send us this and completely optional (this button is simply there to help people that have trouble copy and pasting their review link), but here is some info about this to ease your mind, as well as instructions on how to find it. What is my Amazon public profile? Whenever you look at a review for a product on Amazon, you’ll see the Amazon username of the person that left the review. By clicking on that name, you are taken to their public profile page where you can see ALL of the reviews they’ve left. These are public reviews, of course, and there is no other identifying data on this page other than your Amazon username. This is info that Amazon stores and displays to anyone that wants to see it. Why does Hidden Gems want it? As this profile displays a list of all the reviews you’ve left, we can sometimes use it to grab your review link automatically – thus saving you the step of manually copying and pasting it – something that many of our subscribers have trouble with. This is simply a convenience tool, and if you prefer not to give it to us for whatever reason, you are free to continue logging your reviews on our form manually. Note that grabbing your review link is the only thing we use your profile for and really is the only thing it is useful for in the first place. How do I find it? If you go to any of your reviews and click on your name, that takes you to the page we need. Just copy that link and put it in the box where we’re asking for it (we only need it once). We aren’t looking for your profile name, we’re looking at the url to your profile page. Note that if you are still having problems with this, don’t give up! Please contact us. Send us the name of the book you reviewed and your Amazon profile name, and we can try and find this info for you. What is my Dashboard and how do I use it? One of the biggest issues our readers have is with our emails. In this day and age of spam and other unwanted emails, many legitimate messages get hidden away and never seen even when readers have specifically signed up for them. To combat this, we created the reader Dashboard – A personalized view of all of the info and links you need to be a reader/reviewer with Hidden Gems. The link to your dashboard can be found in any of the ARC emails we send you, and we recommend you bookmark your dashboard and visit it daily. Here’s how it looks, and below this we’ll go through each section in more detail. On the left side of the dashboard you will see your current stats, which includes your Gem status as well as a visual indicator of how many books you’ve reviewed, left reasons for, or are incomplete (meaning you haven’t yet filled out the reader form for them). The total number of books we’ve sent you is at the bottom of that section, along with links to drill down to get all of your forms for books you’ve left a reason for or are incomplete in case you want to update any of those forms. In this section, you’ll see all of the books (for your genres of interest) currently open for sign up, along with their info. If you’ve signed up for a book already, you’ll see a Yes in the “Signed Up?” column. If not, you’ll see an orange EXPAND button that you can click to see more details about the book – like the cover, whether the book is a novel/novella/short story, and blurb. If the book interests you, click the Sign Up link and you should see the same message telling you that you’ve signed up as you do if you clicked that link from your email. If you see a red Needs more readers! message below the Sign Up link, that book is almost closed for sign up but still needs more readers. If it interests you, please sign up as your chances at getting that book are greatly improved. This section gives you a list of the books we’ve sent that you haven’t yet finished reading or filled out the reader form for. The links to log your review (if the book is published) and fill out your form are all there, as is a big orange button to RESEND BOOKS. By clicking that, we’ll re-email you a copy of the book links in case you missed it the first time. Remember, it’s always better to review a book past the due date than not review it at all, but the book links don’t last forever. Eventually they are removed, so download them right away even if you plan on reading the book later. You may have to scroll down the page to see this section, but at the bottom is a list of all of your current ARC genre preferences that was previously only available by clicking the update profile link in your emails. By changing your preferences here and then clicking UPDATE MY PREFERENCES, your ARC genres will be changed immediately. You’ll even see the changes in the Books Open For Sign Up section at the top, where new books may have been added (or removed) based on your new preferences. Note, however, that if you’ve already clicked sign up for a book, or if you’ve already been sent a book, those books will continue to be shown even if you’ve removed that preference from your list. If you have any problems with your dashboard, please contact us immediately and we’ll help you sort it out. Our hope is that this dashboard becomes a page you visit daily, so that you never miss out on any of the books we send. What is the Try to Find My Review Automatically button? One of the most common difficulties our readers have is in sending us their review link. Some people aren’t clear where to find it, others are using a phone or tablet that make copy and pasting more difficult… whatever the reason, we wanted to make it easier. Try to Find My Review Automatically is a big orange button you’ll see right above the review link field on our new reader forms. It’s a completely optional way to fill out your review link designed simply to make it easier for you. When you click that button, a number of things happen. First, our system checks to see if we have your Amazon public profile link on file. If not, you are prompted to add it (click here for more information about this profile link, how to find it and why we need it). Once we have that, we attempt to find your review automatically. If successful, we’ll add it to the form for you. If that happens, you’ll notice that the review and reason fields disappear and all you’ll be left with is the optional author comment field. Please continue to feel free to fill that field in, if you wish. Note that if you leave a comment you must click the Update Form button below the comment box to save it. Note that when you click the Try to Find My Review button, it may take a few seconds before it returns. Please be patient and wait until the form comes back before closing, as it may not be successful in finding your review, which means you’ll have to enter it in manually. Just remember that if your review isn’t found with the button but you still want to add it to the form, you can still add the URL manually and then click the Submit button below the comments box. What does my Gem is Tarnished/Cracked mean? Understanding your ARC Status. The Hidden Gems ARC review service relies on authors sending their books to us to supply to our readers. Each author only asks for a certain number of reviewers and we have thousands of reviewers signed up to our service. So in fairness to both our authors and other reviewers, we need to keep track of who is regularly participating and who is not. We aren’t going to penalize our readers for missing the occasional review because we understand that life sometimes gets in the way and a book couldn’t be read or finished – or there are occasionally legitimate reasons why a reader might not want to review a particular book. However, if readers are consistently not reading our books, or not connecting with them enough to want to leave a review, then it’s likely that our program isn’t for them. Perhaps the books we have aren’t the type they enjoy. That’s okay, but in fairness to the authors sending their books in the hopes of getting them read, and the other readers looking to get those books, we may need to limit the number we send to readers that have stopped participating until/unless their situation changes. Remember that even if you don’t read a book for whatever reason, or if you choose not to review one that you did read, you still need to fill out the reader forms with a reason for not reviewing. Too many empty forms is another indication that a reader is no longer interested/able to participate in the program. Reviewers can see their status each time they sign up for a new ARC or on the left side of their Dashboard. You’re a Gem – This is the highest level and means that you’ve been keeping up with your reader forms – maybe you’ve missed some but not enough for us to be concerned. You will be added to the pool of potential reviewers. Your Gem is Getting Tarnished – You’ve started to miss some books. We’re not overly concerned at this point, but you may start to find you aren’t getting quite as many books sent to you as before so that you have time to catch up. You will still be added to the pool of potential readers when you sign up for a new one. Your Gem is Tarnished – You’re in the danger zone now and really need to catch up on all the books you’ve requested and that we’ve sent. Maybe you need to be more selective in the ones you sign up for and only focus on ones you really have time to read and look interesting enough to you that you think you’ll want to finish it and give an opinion. You will likely not be getting too many of the books you request until you catch up a bit, but will still be added to the pool of potential readers when you sign up for a new one. Your Gem is Cracked – You’ve missed far too many books and in fairness to our authors and other readers, you will not be getting any more until you can catch up on the ones we’ve already sent you. You will not be added to the pool of potential readers when you click to sign up for a new one. What can you do to improve your gem status? Catch up on your reader forms for the books we’ve already sent so we know that you are still interested in participating (even when you didn’t review)! If you aren’t filling out the forms (they only take about 30 seconds or less) then we have to assume it’s because you aren’t reading or enjoying any of the books we’ve sent. If that’s not the case, then fill out the forms so we know and can get you back to reading! You’ll see the forms you’ve missed on your sign-up page or Dashboard. Please fill in any missing reviews or reasons for not reviewing as soon as you can. If you’ve left reasons for books that you later added a review for, you can go back and update your forms as well. We really don’t want to block any of our readers from reading new books so please do your best to catch up and only ask for books you have the time and interest to read. If you think your status is incorrect or have any questions about it, please don’t hesitate to contact us. Our reader forms allow readers to send us their review links, reasons for not reviewing and comments to the author. Forms can be edited and include links to the book on Amazon (once available), buttons to have the files re-sent to you, and even a button for making logging your review easier than ever before. For the most part we’ve designed these forms to be fairly self-explanatory, but it might be helpful to quickly go over them. Here’s what the form looks like, although you may see multiple copies of it on some pages, depending on how many forms you have outstanding. At the top is the title and the review due date, along with a link to the book on Amazon (unless the book isn’t yet published) in case you haven’t already left your review. The Try to Find My Review Automatically button is described here. Essentially, if we have your Amazon profile on file, clicking it will let us try and find your review for this book automatically so that you don’t have to copy and paste the URL in manually. If you don’t/can’t use that button, there are 2 text boxes below to capture your review or your reason for not reviewing (this form only accepts a review OR a reason, not both). Just remember to PRESS THE SUBMIT BUTTON if you do use those boxes otherwise your info will not be saved. Below that is a field for your optional comment to the author. This is the only field that shows up if you return to a form that already has your review link posted to it. Beneath that is a link to have the download links for this book emailed to you again, in case you lost the original email or never got it in the first place. Now you can still easily catch up – better late than never! However, the book links don’t last forever so make sure to download them ASAP. That option is only available for a few days after reviews are due. Note that when you’ve been sent multiple books that are now due but you have not yet filled out a form for, you may see multiple copies of the form above when you click to sign up for a new ARC or click on your list of missing forms from your Dashboard. Each one has the name of the book at the top, so please fill them out ASAP and make sure to add the correct reviews to the correct boxes (or use the auto button if available). Whenever I add my link it says it’s wrong? In order to ensure your review link is the link we’re looking for, our system performs some validation checking against it. If those checks fail, it means what you entered isn’t the correct permalink URL to your review and we will give you an error with information that is hopefully helpful enough for you to understand what you did wrong and correct it. If you continue to have issues entering your review link, even after reading our FAQ question about finding the correct link, then please contact us and we can try and help. First of all, please make sure that you’ve added contact@hiddengemsbooks.com to your contact and/or safe sender list. Otherwise, some of our emails may end up in your SPAM or JUNK folders (or the Promotional tab in Gmail). If you’ve done that and still don’t see those emails, you can still get those links again if the books aren’t too old. There are a couple ways to do this. The easiest way is to go to your Dashboard and check Your Current Reading List. Find the book listed there and click the RESEND BOOKS button. You should get an email with the download links emailed to you shortly. If you don’t, send us an email and let us know and we’ll try to help. Another way is to go to the review form (in cases where you were sent a review is due/overdue email, or through your Dashboard) and at the bottom of the form will be an option to have the book links sent to you again. Note that book links are only available for a limited time, so please make sure to download them as soon as you can. The links to download the books are removed a short while after the review period for a book is over. How do I know if I was chosen to review a particular book? If you think you may have missed the email telling you that you’re a reviewer for a particular book, a good idea would be to check your Dashboard. If you’ve been chosen for a book, it’ll show up in Your Current Reading List section and there will be a link to have the book download links emailed to you again. It’s a good idea to get in the habit of checking that page regularly, but even if you miss that, after the review period is up you’ll get an email that reviews are due. Even if that’s the first time you realized you were chosen for that book, you can still read it! Better late than never! We’d always rather have you review a book late than not review it at all. How do I catch up on old reader forms? The most common reason you may not be getting chosen for many (or any) ARC books anymore is because you are too far behind in filling out the reader forms and/or leaving reviews for the books we’ve already sent you. The best way to resolve that is to fill those forms out as soon as possible. The easiest way to find all the forms you’ve missed is via your Dashboard. Another way you’ll see those forms is whenever you try to sign-up for a new book – you will be either shown all of the forms for the books that you’ve missed or given the option to have them sent to you. Either way, you can fill in the missing forms with your review links or reasons using those forms and catch up. Once you’ve done that, you should find that you are being chosen for books again. Why am I being asked if Hidden Gems can send me notifications? One of the biggest issues readers have with our service is that they aren’t getting all of our emails, so they miss book sign ups or worse – they sign up for a book but then miss the email telling them they were chosen and sending them the links. Reasons for this vary, but the most common is overly aggressive email spam filtering that ends up hiding our emails simply because they come from a mailing list, ignoring the fact that subscribers have signed up for these emails explicitly. Your dashboard can be used to combat this issue, but you still have to remember to visit it regularly. So to help with that, we’ve introduced a new notification feature that sends your computer or device alerts about sign ups, book sends or review reminders. This service uses Google’s Firebase Cloud Messaging service, so you can be confident that it is both reliable and secure. And once you’ve accepted or declined the notification request, you won’t be asked again on that device unless you reset your browser settings. Note: Currently, the Firebase Messaging is not supported on iOS devices, although that may change in the future. To accept the notifications, you must first read a quick message from us about the notifications, and then decide whether to allow or block the notifications in a popup from google. When you see this message, just click Continue. Next, you will get the message from google asking if you want to accept the notifications. Click Allow so that we can send you notifications and remember that even if you allow this now, you can change your mind later and even turn off individual notification types from via your dashboard at any time. As it is much easier to accept the overall notification setting and then turn off the individual notifications you don’t want later via the dashboard than it is to block the notifications altogether and then later change your mind, we recommend accepting the notifications when asked and then adjusting your preferences after using it for some time. Either way, you can find instructions on turning the settings off at the browser level or individually via your dashboard right here. I changed my mind about notifications, how do I turn them off/on? If you accepted or declined receiving notifications when first asked and have since changed your mind, you can alter your browser settings to fix that. As we use Google’s Firebase Messaging service, it is best to follow their instructions on how to do that. Note: Each device that you use to visit your dashboard will ask you to accept or decline the notifications, so we recommend accepting from your most commonly used device. You can accept from more than 1 device (up to 2, max), but that means you will get the same notifications on each, and changing the individual notifications (see below) on your dashboard will affect all devices. As a reminder, we recommend leaving notifications on if you are an active ARC reader, as many of our emails don’t make it to all subscribers due to over-active spam filtering by many email providers. Still having difficulties with our ARC program? If you still have any issues or questions after reading this FAQ, please feel free to contact us and we’d be more than happy to help! Our main goal is to help connect readers with new and exciting books by their favorite (or soon to be favorite) authors. If there is anything preventing that from happening, we’ll do our best to get it resolved ASAP. © 2017-2019, Hidden Gems Books. All rights reserved. Hidden Gems Books is a participant in the Amazon Services LLC Associates Program, an affiliate advertising program designed to provide a means for us to earn fees by linking to Amazon.com and affiliated sites. We may earn a commission from links that lead to the Amazon site, including book links.